As the 2017 Cabela’s Collegiate Bass Fishing Series kicked off its lineup of four major televised events season on Kentucky Lake this past week, there was only one constant and that was changing conditions. During the official week of the event collegiate anglers saw everything from violent thunderstorms and bright sunny days with temps in the 60’s, to blinding snow and freezing temperatures. With such a drastic temperature swing and changing weather conditions, many thought the bite was going to get extremely tough and make for a long day on the water. However, a long day on water turned into a day of catching big Kentucky Lake bass for many of the anglers as the fish started coming to the scales. It didn’t take long for the staff and crowds to know that the collegiate anglers were on the fish this week! Evan Owrey, from Bethel University, certainly figured the Kentucky Lake bass out better than anyone and didn’t let the changing conditions get in his head. His stellar performance included winning Session 7 presented by Cabela’s, placing 8th in Session 2 and 6th in Session 6. In addition to those top places, his winning fish in Session 7 was the overall big bass of event giving him the coveted title of Power-Pole Big Bass Award. We caught up with Evan after the event and asked him some questions about the event. Evan, what was your strategy going into the event? What did it feel like to hook that fish? Tell us about the rod, reel, line and bait used as well as what you keyed in on to catch that fish. What’s ahead the rest of this fishing season? What was your overall impression of your experience at the event? Congrats to Evan and all the anglers who took home prizes at the Cabela’s Collegiate Big Bass Bash presented by Berkley. We would like to thank all of our great partners that help us make this event possible. 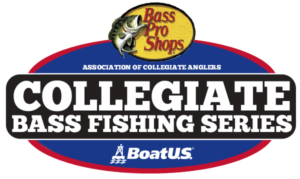 We are off to the next ACA event on Lake Dardanelle in Arkansas for the Cabela’s Collegiate Bass Fishing Open on March 24-26, 2017.